The Vegan Month of Food aka VeganMoFo is back! And yes, that is my excuse for not posting a single recipe in over two months. This year posting every day is going to be quite a challenge and I admit that I did prepare a few posts. For me VeganMoFo is the best part of the year. During this month there is a strong sense of community among the participating bloggers. It feel like the old days, when we were still carving our recipes into stones to exchange them when the number of vegan blogs was limited and the bloggers still had the time to comment on everyone else’s posts. And for me that is what blogging is actually about: being part of a community and contributing something to it. Like many others I don’t have very much time left for blogging anymore. I wish I could do it every day, because it’s so much fun. So for the month of September I am going to pretend I can do this every single day. I know “Vegan Month of Cake” is not very original when you consider that this blog is about cake most of the time anyway. But since cake makes everything better I’ll stick with it. Before I am going to fill this blog with cake post after cake post, I have a simple, comforting, and savoury soup recipe for you, which has been our companion for these last couple of unusually chilly days. I always have a variety of lentils and beans to choose from and for this creamy and thick soup I chose yellow split beans (moong dhal). They cook longer than split red lentils, so feel free to substitute those if you are in a hurry. Instructions: Place crushed cardamom pods, cumin, coriander, mustard seeds, and cloves in a small pan. Toast them for 3-5 minutes or until the seeds start to pop. Make sure they don’t burn. Set aside. Heat a large pot and add oil, Add chili and garlic and fry for 1-2 minutes. Add toasted spices, beans, and water. Bring to a boil and cook for about 30 minutes. Add 200 g fresh or canned chopped tomatoes, salt, and cook until the beans are creamy, about 10 minutes. Season with salt and pepper. Serve immediately. wo findest du denn mung dhal? ich hab davon schon öfters gehört, den aber bisher noch nirgends entdeckt… kaufst du ihn in asia läden? oder gibts den auch in bio supermärkten? ich wohne in der schweiz, da haben wir eher kleine bioläden, aber bald zieht alnatura in meine heimatstadt ein. meinst du, ich könnte den dort finden? Hallo Olivia, ich kaufe das immer in indischen Läden. 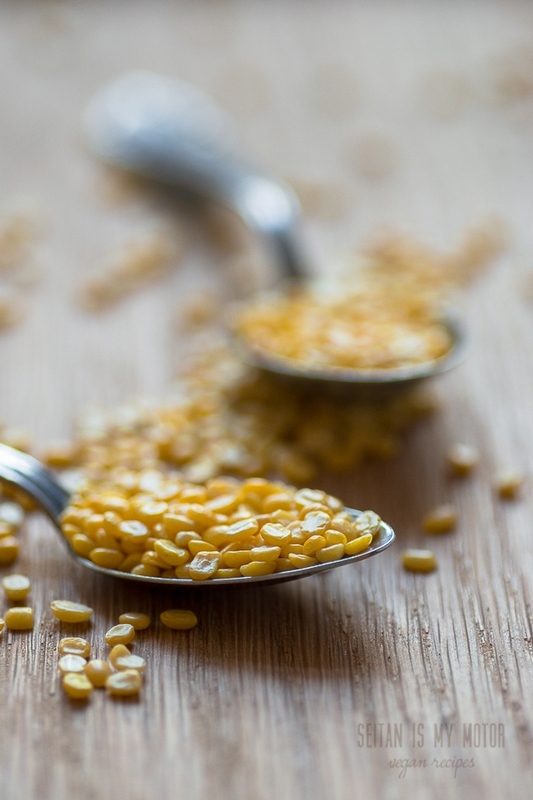 Alnatura hat gelbe halbierte Linsen, Mung Dhal habe ich da noch nie gesehen. Auch in unseren Bioläden gibt es das nicht. Die haben aber ganze Mungbohnen. Vielleicht gehen die auch? YUM für das Dhal und YUM für deine MOFO-Theme!!! Firstly, this dhal looks gorgeous. I have a bag of yellow split peas ready to go! So pleased to see you taking part in MoFo again this year- and with cake! I’m sadly not taking part this year. I just can’t commit to it right now as I’m finishing up my dissertation and it’s pretty important I get it done! I’ll definitely be reading and commenting as much as possible and carrying on with my normal blog posting a few times a week. Yes! You are such a mofo queen! I’m so excited to follow you this month. Good luck! Love the dahl, it looks glorious. I think dahl is just a little more special with the yellow lentils, maybe because it does take a little more effort or time than with red lentils. oh great! I can’t wait to see more of your amazing posts this year. I have done NO pre-planning and I dont’ even really have a theme. How unlike me!?! So, I will jump head-first into MoFo on Day one and see where the current takes me! Dahl can do no wrong in my house! I’m participating in Vegan Mofo for the first time this year. I start daily german classes too so hopefully I can do some of my later posts in Deutsch! That would be awesome! I am looking forward to it. I’m so excited you’ll be participating. I just handed in my cookbook manuscript yesterday so I need a break but I plan to at least comment like crazy. I miss the old days of blogging too so I plan to up the community factor all through September. Congrats on submitting your manuscript! Will enjoy seeing your cakes during Vegan MoFo. I too have prepared ahead for mofo because I figure that is the only way I will get it done especially as September is a busy month for us. But I am still feeling overwhelmed as it is participating in the community and reading lots of blogs that makes mofo such a busy time as well as posting a lot on my own blog – but it is a great way to get out of the rut and see what other blogs are doing. 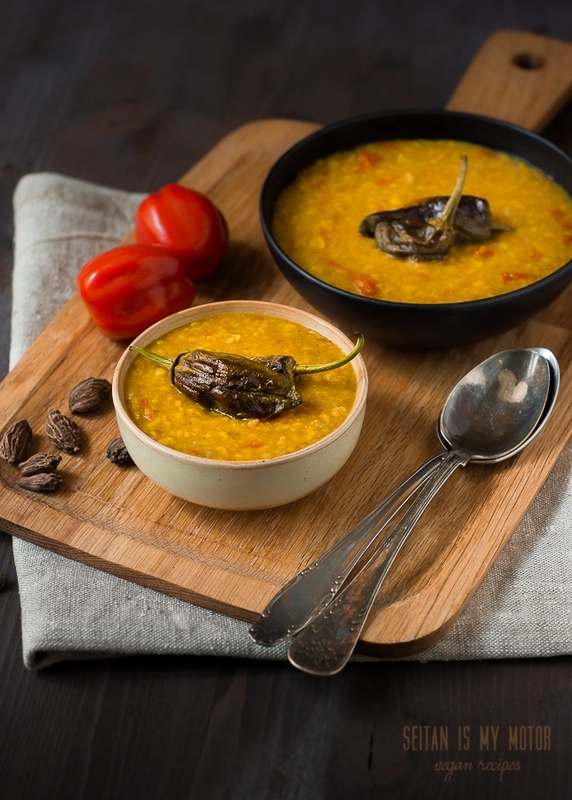 Love your dal – it is one of the meals I make when I feel lazy but when I really pay attention to the spices I really notice the difference. Yeah, it’s busy here, too! I am pretty sure I won’t be able to keep up with all the fabulous stuff people post. Yay! That dahl looks delicious (and easy!). I’m really looking forward to all your cakes. I’m very impressed that you manage to post so many baked goods. I’m doing a meal-salads-in-ten-minutes-or-less theme and I’m sure my PhD progress will suffer the consequences. I am so glad you are participating this year and will be doing a cake theme again. I LOVED your mofo posts last year. Well, I always love all of your posts……. I tell myself that the reason I haven’t blogged all summer long is because I’m saving up my recipes for when MoFo begins…and that *was* my original intent a few months ago. Now that I’m in law school (while still working full time and doing the Mom thing), I’m lucky if I find time to check my e-mail more than once a day. Same here! I am not in law school, but right now I feel lucky if I can check my emails once a day, too. hang in there, I hope it’s still fun! Always! I’m going to focus on Animal and Environmental Law once my required classes are over, so no matter how much work it is it’s definitely worth it! Ja, manchmal lese ich Gedanken:) Und danke für die ganzen Komplimente!